Genius. When you read or hear that word, who do you picture? Albert Einstein? Marie Curie? Leonardo da Vinci? Gandhi? History gives us plenty of examples to choose from. Philosophers, scientists, generals, writers, artists, and more. It’s hard to nail down exactly what it takes to be a genius. Perhaps it is a high IQ. Or maybe it’s entrepreneurial success. Or maybe it’s just the willingness to take the tools that you have before you and put them together in a new, creative way. Once such genius was born 54 years ago today. Long before he was the world’s third richest man (and occasionally the richest man), Amazon’s CEO/Founder Jeff Bezos was born Jeffrey Preston Jorgensen in Albuquerque, New Mexico, USA on January 12th, 1964. His mother, Jacky, was only 17. And Jeff’s biological father, Ted Jorgensen, did not officially meet Jeff until much later. When Jeff was 4, Jacky married a man named Mike Bezos. Since Mike was more of a father to Jeff than Ted, Jeff took Mike’s last name. From an early age, Jeff displayed scientific talents and an interest in technology. In 1986, he graduated from Princeton University with a Bachelor’s in Science in electrical engineering and computer science. After graduating, Jeff worked on internet-enabled opportunities with D.E. Shaw, a Wall Street hedge fund. D.E. Shaw was the last “real job” Jeff would have before starting his own company. For Jeff, the opportunities were obvious. And despite the comfort of a fat Wall Street check, Jeff knew he had to take the risk and dive right in. Following a cross-country trip from Seattle to New York, Jeff drew up a business plan for the company that would someday become Amazon.com. He chose the name Amazon because it sounded “exotic and different”, exactly how he (and many at the time) viewed the Internet. 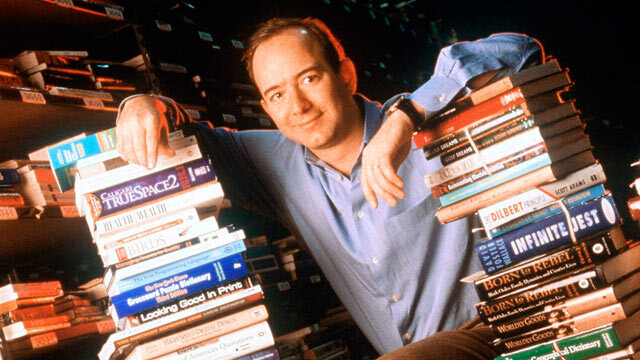 Initially, Jeff started Amazon.com in his garage selling books. In the early days, Jeff’s business was probably no different than a lot of first-time Amazon sellers. He purchased wholesale inventory. Then, he and his staff picked and packed the orders and shipped them out. It was a very shabby operation, too. In fact, Jeff and those who were there in the early days often share an anecdote where someone suggested to Jeff that they get tables–they were working on the floor! In just two months after launch, Amazon.com was earning $20,000 per week. Less than three years later, Amazon issued its initial public offering at $18 USD per share. Quite a leap! Of course, there were some challenges along the way for Amazon, too. Barnes and Noble sued Amazon in ’97 arguing that Amazon’s claim it was “The World’s Largest Bookstore” was false. The two companies settled out of court. The next year, Wal-mart sued Amazon claiming Amazon stole the retail giant’s trade secrets by hiring its former executives. That case, too, was settled out of court. When the Dot Com Bubble burst in 2000, Amazon watched its price per share drop from $107 to $7. Fortunately, Jeff and Amazon’s solid business plan helped it weather the storm. 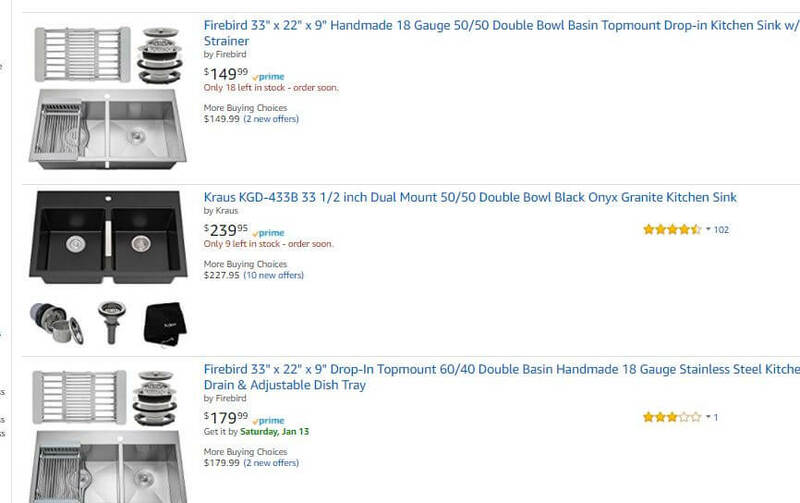 Amazon sells everything… even the kitchen sink. Eventually, Amazon grew beyond books. First, they started selling other products like DVDs and toys. These days, Amazon sells nearly anything you can dream of. That’s why since 2000 Amazon has had that clever curve in its logo pointing from the A to the Z; after all, Amazon is The Everything Store. 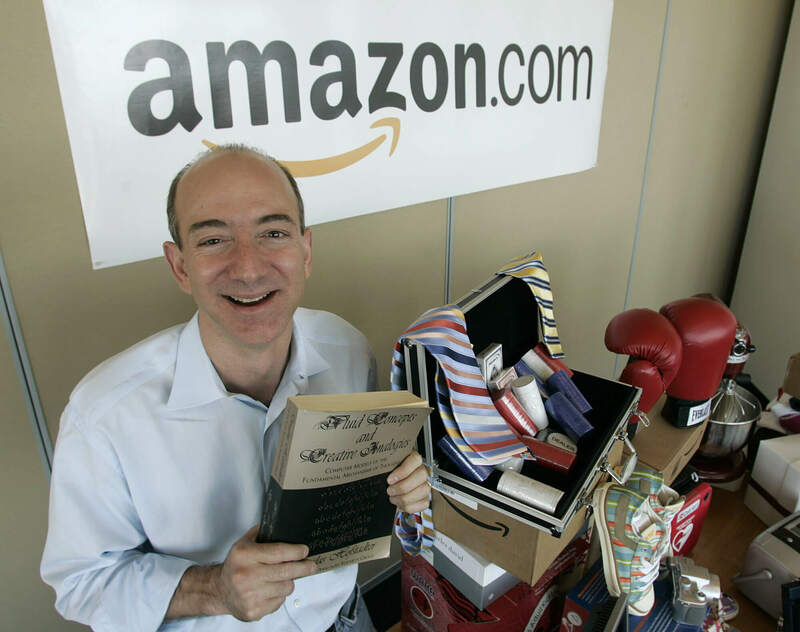 What made Amazon unusual is that it did not expect to earn profit in its formative years. Of course, its stockholders hated this. But Amazon’s dedication to providing a top-notch customer experience is what cemented its current position as the largest online retailer in the world. Today, Amazon.com employs over half a million employees around the globe. It is the world’s largest internet retailer by revenue. A single share of Amazon stock is worth (as of this writing) over $1,200 and grew by nearly 50% in 2017 alone. This gives Amazon a current market cap of 615.20 billion dollars, placing it as the 4th largest company in the world just behind Apple, Google’s parent company Alphabet, and Microsoft. Is Jeff Bezos A Genius? I can’t remember a single day in the last three years (and probably longer) that I didn’t say the word “Amazon” in a sentence at least once. In fact, I can’t remember a single day when I did not receive a “smiley face” box in my mailbox or on my doorstep. I’m sure you can say the same, too. So, there’s no question that Jeff Bezos and Amazon changed the world. But is he a genius? He didn’t come up with a theory of relativity. Nor did he paint The Last Supper. And Jeff didn’t struggle for Indian independence like Gandhi and he didn’t discover radiation, either. Remember, this is just a guy who sold books out of his garage. A guy who didn’t even think to use tables at first! 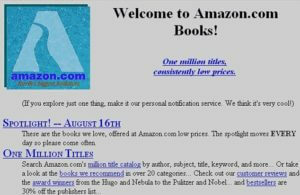 He had competitors and troubles and damned if it wasn’t a long, tumultous crawl to bring Amazon from the pale, blue screen it was in 1994 to the internet behemoth it is today. But know this: any of us could have been Jeff Bezos. Keep in mind that none of these things–Word Press, Google, Instagram, Facebook, and even CSS–existed back when Jeff created Amazon. But he took the tools he had and made the best of it. Look at All the Tools You Have Now! By now, you probably know that you can sell your own products on Amazon. But that’s not even the best part: Amazon will actually store your products for you in one of their fulfillment centers. When a sale is made, they pick, pack, ship, and handle customer service on your behalf. So the days of stuffing books into envelopes in your garage and dropping them off at the post office are over! Earlier, I wrote that Amazon spent years building market trust and a powerful customer base at the sacrifice of profits. Now, using Amazon’s system you can leverage that hard-earned goodwill and sell hundreds–sometimes thousands–of products per month through their product search engine. In the 1960s, a man named Phil Knight made a trip across the world from Oregon to Japan. There, he discovered a company producing a shoe called Tigers. He ordered a sample to be sent back to the US. That first sample took months to arrive in the US. Happy with the sample, he placed an order–nearly a year passed ’til he got those. Later, when issues came up, Phil had to travel all the way back to Japan to sort them out. Somehow, he made it work, and to this day Phil’s shoe company–now called Nike–is a multi-billion dollar household name. Fortunately, it’s a million times easier to source products. In fact, you can hop over to Alibaba.com, submit an RFQ (request for quote) and have a multitude of assessed and trustworthy overseas vendors fighting for your business. Then, once you make an order, you can have your products in the country in as little as three weeks. And if those two mega-companies aren’t enough, you’ve got a whole host of software to aid you in your entrepreneurial endeavors. First, Jungle Scout takes all the mystery out of product research. Then, Fetcher helps you analyze profitability. Once you launch, Jump Send jump starts new products by putting them in front of hundreds of thousands of ravenous online shoppers. And finally, Splitly gives you the tools to easily defeat your competitors. Additionally, we offer up a wealth of knowledge through videos, blogs, online courses, and more. Our customer service staff, writers, and even the heads of the company love answering questions and helping new and experienced whenever possible. 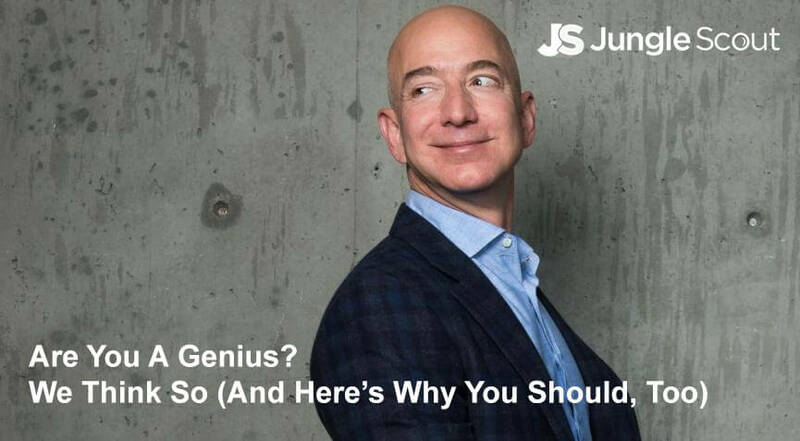 That’s why it’s so exciting that we’re starting up what we call The Genius Series in celebration of Jeff Bezos, Amazon, and the future of internet retail. What if you could learn all the tips, tricks, hacks, and strategies that top Amazon sellers use to make a 6, 7, 8-figure income through Amazon? Many of us here at Jungle Scout have been Amazon sellers for quite a while. Jungle Scout itself will celebrate its own third birthday this year. Without our fans and users, we know we wouldn’t be the valuable resource that we are today. Whether you’re a new seller or old or even just starting to learn about the Amazon selling process, it’s the feedback of people like you that have helped us improve our ability to better serve the seller community. Recently, we surveyed over 1,000 people to determine what the biggest challenges are for Amazon sellers. What we discovered was quite interesting. Naturally, we could have sat on this information ourselves, but just as Jeff Bezos gave back to the world by creating Amazon and the Amazon FBA program, we knew we had to share what we learned to. Product hunting – how to find the perfect product to sell on Amazon and make a huge passive income. Some of our best and brightest–as well as plenty of guests–will contribute to this series including our very own founder/CEO and experienced Amazon seller, Greg Mercer. There will be videos, blog entries, tools, and resources to help you not only learn how to become an Amazon seller, but how to better face any challenges you may be up against. We can’t wait to share everything we have with you and watch you become the genius that we know you are. I’ve found out about this opportunity a week ago. Already have done TONS of reserch but still have that feeling… super anxious to get started though. I found a product with 3k units sold on average per month. Using the FBA calculator, undercutting the average price by 40% still leaves me with $20-30 per item in net profit. At the average price (after ranking) $30-40!!! It’s ridiculous! I have to be doing something wrong with the numbers. Every 30-60 items sold gets me a new pallet to my doorstep (DDP/CFI). Every pallet has 1k items! The biggest listing have 200-300 reviews and there are only 10 listings. The best part is that this particular product has 4-5 variants each in the EXACT same situation. On average around 4-6hrs per day NO LISTING has stock left. Each dollar I make pays for 4-5 items (reorder). But I’d still scrutinize the hell out of it, just to be safe. 200-300 reviews can be pretty steep competition as it’s pretty tough to get reviews on Amazon (without cheating, that is) since they NERFed incentivized review. JumpSend.com will help a bunch, but it’ll still take some elbow grease. You might also look at the category and make 100% sure that you can get into it before you jump in. A few categories, especially Topicals and Toys and Games, have really gotten tough to enter in the last year or so. Also, a product that’s selling 1000+ units per month means you’ll probably need a huge order to kick things off. To protect yourself, you might try kickstarting your product to test market demand and reduce capital risk. So if it DOESN’T turn out to be the winner we hope it is, you won’t be stuck with 3,000 widgets you can’t do anything with. Haha… sorry to be devil’s advocate! Just keeping you safe. You should know if you signed up once you get an email. If you didn’t, contact one of our CSR folks and they should be able to help! Hoping to make sense of the many lost rabbit trails out there when researching/resourcing products. Thanks! Total newb here and looking forward to the tutorials! Thank you so much for all this! I am not an AMZ seller, but it is my hubbie reading about FBA , jungle scout or anything related to e-commerce. Hope to continue having fun reading this topic and who know if some day I become as genius as Greg Merce.